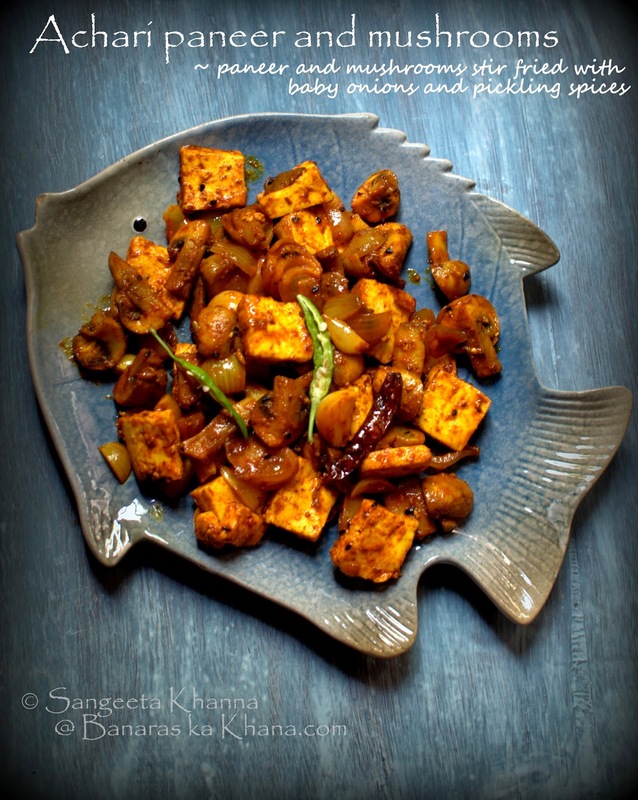 Paneer and mushrooms are consumed quite frequently in my kitchen especially for the lunch box meals that Arvind takes every day. Something that stays tasty even when cold, retains flavours and is not messy to eat. I have served this stir fry to large gatherings too and have found that this is one of those recipes that never fail to impress. For a small serving the cooking time is just about 10 minutes. This kind of achari stir fries are a great side dish with Indian meals of daal, rice, roti and bharta or salads. It can even be rolled up in a roti or stuffed in a sandwich for a quick meal. Suits me many a times. Make a paste of all the powdered spices in 3 tbsp of water and keep aside. Heat oil in a kadhai and tip in the spice paste slowly. Let it cook till the oil separates, stirring occasionally for about a minute or so. Now add the baby onions, mushrooms and paneer in that order and keep stirring it for a few minutes. The ingredients do not need much cooking but the spices should penetrate them, high heat and frequent stirring does the needful. Finish with lime juice and slit green chillies, add coriander greens if using and serve hot or cold. This stir fry stays well at room temperature for a day and refrigerates well for a week or so. Nigella is Kalonji seeds Bikram. Also called a Mangrail in UP, onion seeds in vernacular English. what a look and colour . I always cook this combo the usual way with chilli, turmeric and coriander powder but you gave it an interesting twist by making it achari. Your recipes always inspire me to cook. Thanks Kirti. So glad you liked it. This turned out lovely! Thanks Sangeeta. So glad you tried and liked it. Thank you.